Pinch of Yum is one of my favorite food blogs. Without even knowing it, I had a bunch of her recipes already pinned on Pinterest. You know the good ol’ Pinterest motto, PIN NOW READ LATER! except I hardly ever really READ LATER, mostly I’m just constantly looking for new slutty food pics to add to my collection. Anyway, one day, I was combing through my food board looking for something new to make and I came across her recipe for Healthy Mexican Casserole with Roasted Corn and Peppers. I read the blog post and it made me laugh. Like, a lot. Because part of her blog post was about memes and I have a similar, weird obsession with memes (especially the ERMAHGERD girl and the ermahgerd pet memes that followed) and as I was reading, I was thinking YES I AM NOT THE ONLY ONE! Also, she said she was inspired to create this recipe by my favorite frozen bowl by Amy’s. So it was kind of a no-brainer. I had to try this recipe. The night I made it, I was so inspired by the technique of dry-roasting the veggies. I had never heard of this technique before. I love fajitas – but one of my complaints is that often, the veggies get too oily or never really seem to get charred. They just kind of get limp and eh. So as I was roasting away, I was all turned on at the idea of truly charred veggies without having to hold them over an open flame and peel the skin off and blah. I was already in love. Then I finished up the recipe and served it to my husband who said – literally – “This is good. THIS is GOOD. THIS IS GOOD.” I totes agreed with him and was soooo excited to eat the leftovers at work the next day. So the next day I had a particularly rough day at work. Work sucked. Balls. But I got to lunch time and I was giddy at the thought of nomzing on this casserole. As I sat at my desk to eat, I decided to peruse the rest of Pinch of Yum. Not only did I find a bunch of recipes that looked familiar from my Pinterest board, but her blog posts are really funny. 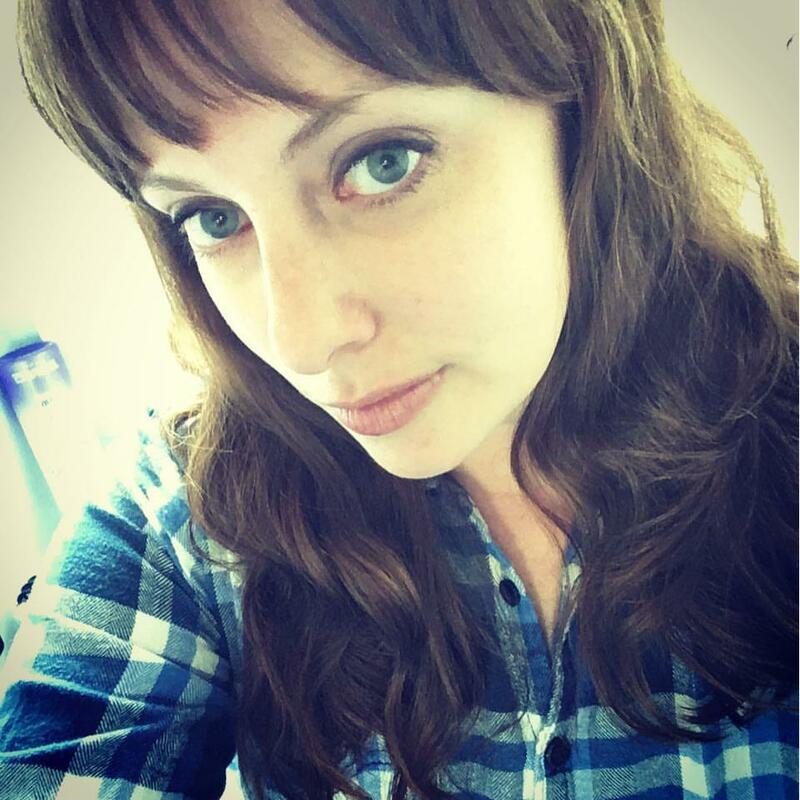 And Lindsay is really likeable and I’m sure we’d be friends in real life. I think I spent the rest of the afternoon reading her blog and getting inspired to start my own food blog. (I even emailed her with tons of fangirl praise and she totally emailed me back and I was fangirling all over the place at work.) The wheels started turning in my head, about all the food I make and all the food I love. And I started thinking about how if I was going to be a food blogger, then I’d have to be creative and start coming up with some recipes on my own, like all the time. And I started thinking about all the recipes I love and how could I change them up to make them mine and how could I get creative with ingredients and the very first answer was staring me right in the face. I loved this roasted veggie casserole so so much. Therefore, I must find a way to make it into nachos, naturally. Because nachos are like the perfectest food ever and I am kind of a nacho queen and wouldn’t it be great to have more nacho recipes in my back pocket??? Guess what I made shortly thereafter? These nachos. 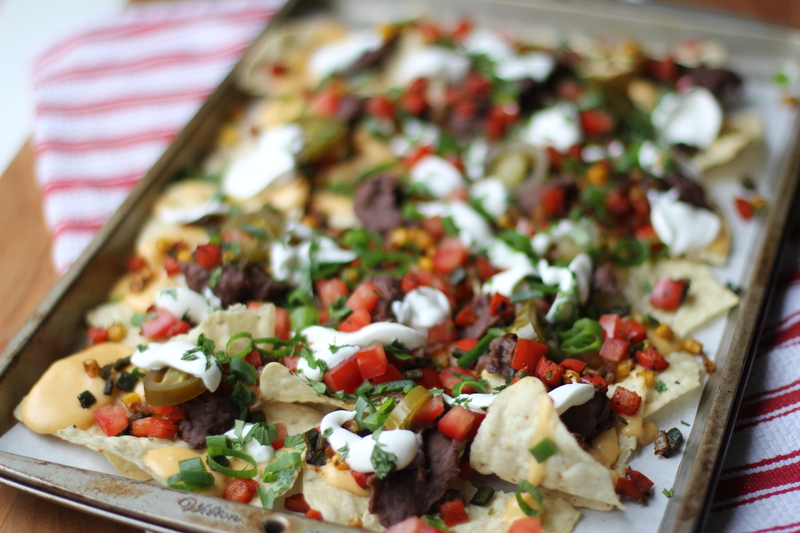 Theeeeese nachos are like oh my gosh. They might even be healthy. Maybe? Right? Well they say to eat your colors and they also say to eat your veggies and I think when you eat these nachos you will feel like you met the FDA requirements of color and veggie intake for the day. Seriously it’s like a whole food pyramid right there on the tray. So feel good when you eat these. Everything is homemade and therefore healthy. In my book anyway. By the way, can I just get a high five for resisting these nachos long enough to take pictures of them? Kthx. 2. Start by making your Cheese Sauce: Warm milk in the microwave for 2 minutes. Melt butter in a saucepan over medium heat, then whisk in the flour. Let the flour bubble and cook for about 1 minute, whisking constantly. Whisk in the milk, and whisk continuously until you feel it thicken. Once it starts to thicken, turn your heat down to low. Whisk in the cheddar cheese. When all the cheese has melted, whisk in the hot sauce and salt and pepper to taste. Taste as you go. This cheese sauce can take a lot of hot sauce, it will depend on your preference. Keep on low heat until you are ready to assemble your nachos. 3. Roast your Nacho Base veggies: You will have to do this in batches. Heat a good non-stick skillet over medium-high heat. (I do not use oil for this; however, if you are scared of ruining your nonstick pan, use a little bit of oil to barely coat the skillet.) Add enough of the veggies to form a single layer in the skillet, and sprinkle them with chipotle chili powder and cumin. Let them sit and sizzle for a couple of minutes to develop a nice char, then stir them around. Let them rest again to develop more delicious char. Repeat stirring and resting until you are satisfied with the char on your veggies. When done, pour into a bowl and season with a little salt. Repeat the whole process until you are out of veggies. Keep the bowl in a warm place (I like to keep it on my stovetop towards the back). 4. Warm your refried beans: Scoop refried beans into a pan and heat over medium-low heat until warm. They should be easy to stir and not too stiff. 5. Warm your tortilla chips: Line a baking sheet with parchment paper. 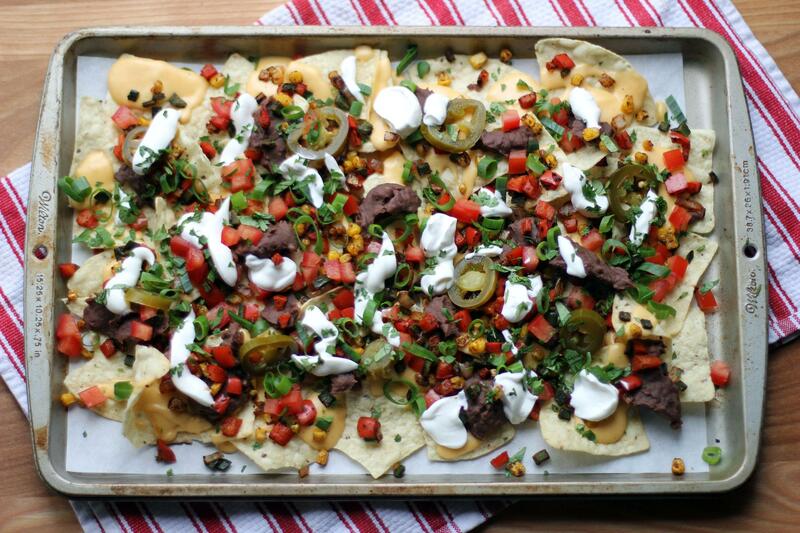 Pour tortilla chips onto the baking sheet and arrange into a single layer. Pop into the preheated oven for 5-10 minutes, until warm and crisp. 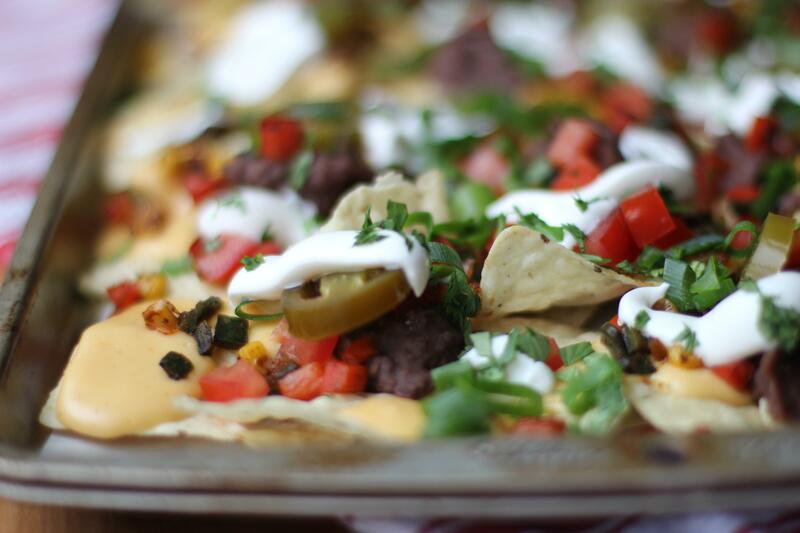 **NOTE** Nachos are totally customizable. If there is anything in this recipe that you aren’t jazzed about, take it out, swap it with something else, or add whatever strikes your fancy. This is the combination of flavors I have come to salivate for, but feel free to use your own creative juices and really make these nachos your own.